We announced earlier this year a partnership with Sashaco, a local (Kirkland, Washington) startup company who began buying our silks last year and makes beautiful hair clips and pins out of our ribbons. Here we have a collection of photos of their wonderful work! As 2013 winds down, we find ourselves without much time to reflect on what a crazy year it has been as we are looking forward to what 2014 has in store for us. We expect big things to come from this and our other (soon to be revealed) partnerships as we keep our eyes on what is next. I am sure you will agree, these silk flowers are fantastic! We have over 170 colors now in our silk line and there are so many that would work beautifully in this clip format. Imagine the brides who can color coordinate their whole suite of paper goods with their bridal party attire, just by tying together the ribbon on their invitation with the ribbon in their flower girl’s hair. What do you think? Each color we make comes out so uniquely on these flowers, we can’t wait to see them all! Eco-wedding ideas – originally posted in 2004, still relevant today. Several years ago we collected our thoughts and suggestions on ways to tread a little softer with your wedding planning. Collected here are some of those thoughts. I hope you find them helpful. Find out where your diamonds and other gems and materials originally came from. Make sure they come from socially and environmentally responsible dealers. Work with a company like GreenKarat (www.greenkarat.com), who can ensure you that you are buying responsibly. Minimizing the environmental impact of the materials used in your wedding is important. For favors, consider selecting a favor that will actually be used to help heal the planet. Saplings of native trees may be inexpensively purchased from The Arbor Day Foundation (www.arborday.org), and can be planted by the wedding guests at their own homes or in a public place. Seed packets or bulbs may also be dispersed or planted to better the local ecology, whether in a garden or a vacant lot or alongside roadways. A creative way to distribute seed (using minimal packaging) is when it is embedded in handmade paper. 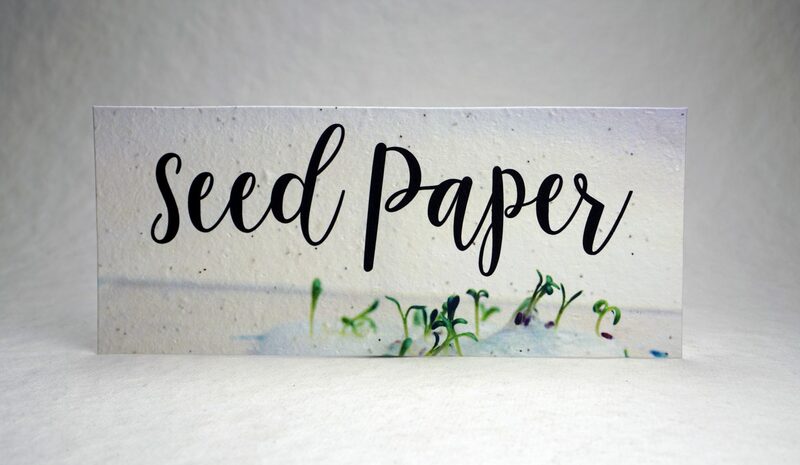 You may even choose to combine ideas, and use your seed embedded paper as placemats, programs, or for other messages for your guests. Flowers are a common centerpiece idea, and come in a variety of forms. Consider using potted plants instead of cut flowers. These can then be given to your guests or planted to commemorate the wedding. If using cut flowers, get them from local growers, and look for organic and sustainable growers. Stay away from true wildflowers, using only wildflowers that have been cultivated. You (or a friend with garden space) might even be able to grow your own cut flowers, with a little planning. After the wedding, the flowers (cut or potted) would be much appreciated at a local nursing home, hospital, or other institutional setting. Candles make excellent centerpieces, but consider the materials used. They can often use petro-chemicals and other polluting, non-renewable resources. Soy based or beeswax candles might make a good alternative to your typical candle. You may even put custom labels on the holders for a personalized effect. Soy candles are a highly renewable resource (soy! ), burn cleaner than typical candles, are bio-degradable and are versatile. Barn Loft Soy Candles provide wholesale prices on soy candles. They can be accessed at www.barnloftcandles.com. A variety of all natural beeswax candles may be found at www.candlebeefarm.com. Don’t forget to shop around and see if there is a local seller with whom you could work to cut down on fuel usage in shipping. Bamboo is an attractive and renewable alternative to many of the materials commonly used for favors (such as wood or plastic based candle holders. If you are interested in using candles for favors or as centerpieces, consider bamboo. For the symbolically inclined, an additional benefit to using bamboo is that it symbolizes good fortune. Living bamboo shoots are also an alternative to cut flowers as centerpieces or even favors. If you wish to use real flowers, make sure you use sustainable varieties (e.g. : stay away from wildflowers unless they were cultivated, try to find flowers that come from draught resistant plants, etc. ), use locally grown flowers, and buy from organic, sustainable growers. You might even be able to grow your own cutting flowers if you have the space, plan well (make sure you consider rate of growth, flowering time, etc.) and have a back up plan in case your harvest doesn’t meet expectations. Alternatives to real flowers are available as well, but use safe, sustainable materials. Silk is preferable to plastic and has improved aesthetically over the years. Silk is a natural and renewable resource, and lasts a long time, so not only will not fade on a hot, sunny day, but can be used to decorate well after the celebration is over. Vintage and consignment dresses will not only cut down on new material use, but will likely be much more affordable, as well. In fact, the money you save by not buying a new dress, might be able to be used somewhere else in the wedding to be more environmentally sensitive. If you do choose to buy a new dress, buy it or have it made with organic material that hasn’t been treated with harsh and dangerous chemicals. Choose wedding party dresses that can be reused at later dates. Some styles are conducive to shortening for later, less formal use. Your wedding party will appreciate this consideration, and will probably feel more comfortable in the dress as well. Consider choosing your own dress with reuse in mind as well. If you won’t be reusing it later for another event, maybe it can be made with the ability to take it in or let it out for reuse by someone else at a later date. Find out where your diamonds and other jewels and materials originally came from. Make sure they come from socially and environmentally responsible dealers. Look into buying a cultured diamond, rather than one developed exclusively in nature. Read about cultured diamonds in Chaim Even-Zohar’s March 2004 article “Cultured Diamonds are Here to Stay” at rediff.com (www.rediff.com/money/2004/mar/31guest.htm). When considering potential honeymoon destinations, there is a lot to consider. How to get there is one consideration. Keep in mind, there are a variety of options available for getting to and from your destination, and each option has its benefits and drawbacks. Driving has its place, but if going very far, will use unnecessary resources. Flying will consume fewer relative resources than driving, but is not your only alternative. The train can be a very romantic and relaxing way to see the sights together in a unique way, while taking advantage of the benefits of mass transit (www.amtrak.com). If you live near a waterway, you might even be able to enjoy a ferry ride to a romantic, out of the way destination. Where you go and what you do on your honeymoon can be as varied as how you get there. If you want to give back and volunteer your time and skills to a cause, there are many options available for you. Habitat for Humanity offers 7-14 day adventures of volunteering around the United States and internationally. Habitat for Humanity brings volunteers together with people in need to build houses. Habitat homes are built at the lowest cost possible, and with energy efficiency and other environmental concerns as priorities. Go to www.habitat.org to find out more about opportunities and itineraries. For the animal lover, consider volunteering for a week or two at Best Friends Animal Sanctuary in Utah (www.bestfriends.org). Best Friends is a common vacation destination for those who want to help out with animals in need, as they welcome people to spend vacation time on site. Volunteers spend time with the resident animals, helping feed, clean and exercise them. There are many options for places to stay while helping out, including cottages close to the sanctuary, limiting your travel distance. While you’re there, you’ll want to take time to explore and appreciate the beautiful natural wonders of Angel Canyon. These are just a couple ideas for unique, environmentally sensitive “working” vacations that are not just fit for a honeymoon, but for your life together after the wedding. If a working honeymoon is not for you, but it is important for you to be sensitive to environmental issues when you travel, consider eco-tourism as an approach to your travel. The eco-tourism concept has developed quite a bit in the past couple decades. Eco-tourism is not limited to wild, out of the way places anymore. According to the Global Development Research Center, eco-tourism is a way of looking at “planning, management and development of sustainable tourism products and activities” (www.gdrc.org/uem/eco-tour/eco-tour.html). By going the eco-tourism route, you can help ensure that your presence does not adversely impact the culture and eco-system of your destination.